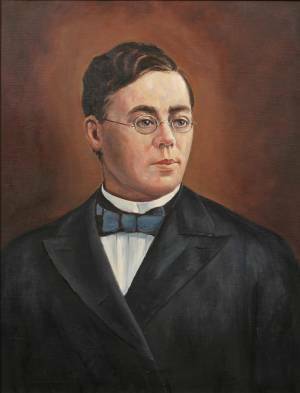 Although scores of Allegheny graduates have become college and university presidents, in the first 190 years of Allegheny’s existence only two succeeded to the presidency of their own alma mater: Wilbur Garretson Williams, class of 1875, and Raymond P. Shafer, class of 1938. Each served a single year under highly different circumstances. The Reverend Wilbur Williams was born in Plainfield, Ohio, on October 9, 1852. After a year at Washington and Jefferson College, in 1873 he entered­ Allegheny where his brother had just graduated. He proved an eager, intense student who complet­ed his course of study in philosophy, lan­guages, and literature in two years, while participating in the Philo-Franklin Literary Society and Phi Gamma Delta. For a year after graduation he taught at the Lake Shore Seminary in North East, Pennsylvania, then accepted a parish at the 10th Street Church in Erie. College Presi­dent Lucius Bugbee, aware of Williams’s linguistic skills, in­vited him to teach French and German at Allegheny in 1875. “Barney” Williams’s classes responded enthusiastical­ly to his buoyant classroom style. During the summers he traveled in Eu­rope, where he lectured in German with a perfect command of the lan­guage. In 1880 he married Carrie K. Wyth ’77. When Presi­dent Bugbee left in 1882 Wil­liams departed also to assume the pulpit of a large congre­gation in James­town, New York. From 1884 to 1885 he held the princi­palship at Genesee Wesleyan Seminary. When Williams returned to the Allegheny faculty in 1885 it was widely expected that he would in time succeed to the presidency. This seemed all the more likely with his reappointment after the faculty purge of 1886, conferral of an honorary Doctor of Divinity degree, and his directorship of the new nonresident doctoral program. Following the unex­pectedly early resignation of College President David Wheeler, Williams took office in June 1888 with energy and a detailed plan for the improvement of the College. He had a generous gift in hand for the renova­tion of campus and buildings. Soon Bentley and Ruter halls were under re­pair, boardwalks laid, and the swamp of Lake George drained. Williams’s energy was contagious and hopes expanded. Unlike his prede­cessor, who had never held an appointed preaching charge, Williams had done so and spoke clearly of the responsibilities of the College for the religious forma­tion of its students. Some faculty did not endorse this new-old thrust. Perhaps Wil­liams was moving too quickly. He could inspi­re others but he did not know how to deal with opposition. His temperament was sensitive and intense, with little experience in diplomatic maneuvering. The issue of “teachers, not preachers” was still uppermost for the faculty and the scars of the 1886 faculty reorganization still painful. Battle lines between the trustees and the Board of Control were drawn. Williams’s warm sup­port by the latter was matched by similar opposition among some trustees who contested the Board of Control’s influence over length of terms of appointment. At the June 1889 commencement Williams recommended the dismissal of a popular professor of mathematics. The Board of Control supported him, but the trustees objected. Believing his judgment on faculty ap­pointments should be final, Williams resigned. He would be­come pastor of some of the greatest churches of U.S. Methodism. In 1889 he served the Broad Street Church of Columbus, Ohio. Around 1894 he moved to the First Methodist Church of New Haven, Connecticut. He was there only a year before tak­ing the pastorate of Union Church in St. Louis, Missouri, where he died on April 16, 1897, at only forty-four years of age.